Destin FL Fishing Charters is quite an experience. You may have fished from a boat before, but our Destin Deep Sea Fishing aim is to make this fishing trip your most memorable ever. In fact, we recommend that you bring your digital or video camera to record the event and to show to your friends and family when you get back home. You have to go deep sea fishing in Destin FL – it’s amazing! A top-notch boat – Whether you are going out for a few hours or for the whole day, you want a boat that is comfortable and in good working order. We take pride in our fishing boat, and there is no vessel more reliable than ours for Destin Deep Sea Fishing. You will have lots of space too – we can handle up to 21 guests at a time but we typically limit the number of anglers on a trip to 15. Expert assistance – If you are not the most experienced angler, that’s not a problem. You will have a ship mate standing by at all times to help with baiting your hook with live bait or lures, getting the line in the water, and the most exciting part of all – landing that big fish. Of course, if you have already been deep sea fishing in Destin many times before, you may want to handle all of those duties on your own. Either way is okay, but help is always available if needed. Convenience items – You won’t just be out on the water with a boat and a fishing pole. We want you to be as comfortable as possible! The boat has air conditioning for summer and heat for the cooler winter days. We also have a microwave so you can enjoy a hot lunch. We even have fresh water and a shower. All the comforts of home, even while deep sea fishing in Destin! A lot of fish – Catching a lot of fish is the whole idea, right? We’ve got that covered. Having done hundreds of fishing trips before, we know where to find the fish. You are likely to see sailfish, wahoo, amberjack, king mackerel, Spanish mackerel, snapper, and grouper. You also have a good chance at catching the big fish that gets everyone excited – the king of the sea – the shark. We have lots of variety! 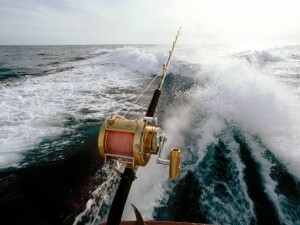 A lot of excitement – When you come with us to go deep sea fishing in Destin, be ready to feel some adrenaline flowing. We’ll get out to the deep water where the biggest fish are found. The captain will put us over a prime spot, and you will drop your hook into the emerald water. The anticipation is part of the fun – what’s down there, swimming around and eyeing your bait? You’ll find out quickly when you suddenly feel that unmistakable jerk on your line – something big is on there, and the battle begins! Great memories – You will come back at the end of the day with more than just a bunch of fish. The memories – hopefully captured in photographs or video – are the best value of all. You will have some great stories to tell your family and friends. The best part is – you can relive those memories by coming back and going Destin Deep Sea Fishing again and again! you haven’t fished like this before.